Japan appears to have a lot of strange things in the eyes of people from other countries. 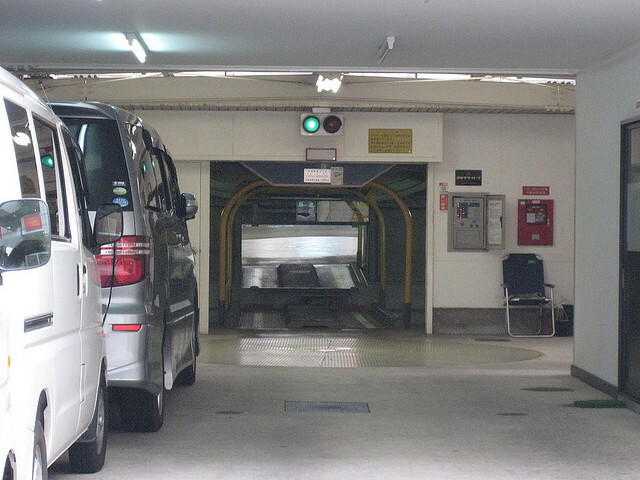 Today, I introduce one of them: the automatic car park. I think it is strange but also pretty cool(^^). I heard that many foreigners are impressed by this type of car park and take a lot of photos when they see one. 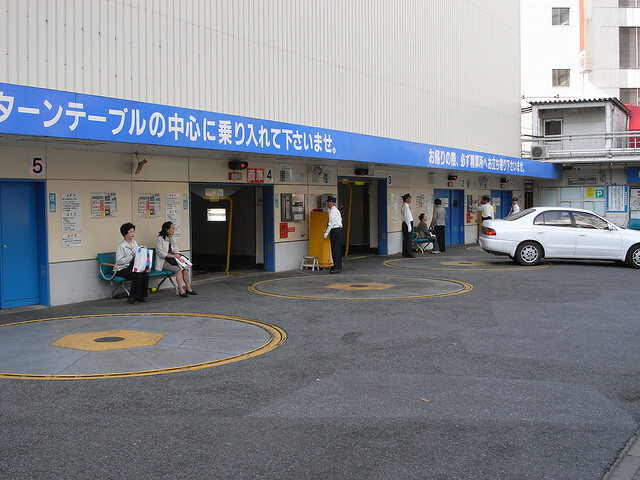 However, automatic car parks are quite common in Japan’s big cities because land is limited and efficient use of every square meter is necessary. Thus, garages are built vertically, not horizontally. Those are turntables in front of the entrance. The turntables rotate your car 180 degrees to enter and exit the garage. This is a slot, into which a car is placed. Then an elevator lifts and rotates the car. Cars are lifted many stories. It works just like a Ferris wheel! Unfortunately you can’t see the whole inside of this “car rotisserie” from the outside. These garages look like tall skinny apartment buildings with no windows, just a big blue “P” (for parking) on the side. I wish the garages were made of glass so that you could see through! Check out this video clip, too! It may help you understand the concept behind this unique parking method. I think it’s cool and hope you’ll like it(^^).